Atlanta police shut down a stretch of the Ga. 400 highway for more than three hours early this morning. A wreck that involved a wrong-way driver happened just before the Atlanta Financial Center tunnel in Buckhead going northbound on Ga. 400. According to the AJC, Atlanta police dispatchers report receiving a call prior to the crash informing of a vehicle traveling southbound in the far left lane of Ga. 400 northbound. 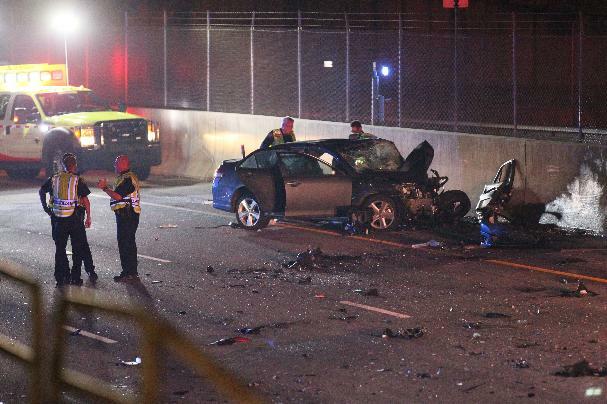 That wrong-way driver collided head-on with another vehicle. Two people have died following the collision. Frampere Ingle, 24, died at Grady Memorial Hospital after the terrible accident; a passenger in Ingle’s car is hospitalized in critical condition. And, the wrong-way driver died at the scene of the accident. Our deepest sympathies go out to the family and friends of these two people. Sadly, this is certainly neither the first nor the only wrong-way car crash that has happened on Ga. 400. Just five days ago, WMCTV reported a Ga. 400 accident caused by a driver travelling southbound in a Ga. 400 northbound lane. Police believe that the driver used the exit ramp at Northridge Rd. to enter the highway in the wrong direction. There are many factors that can impair a wrong-way driver: alcohol, drugs, lack of sleep, distracted driving, time of day. Some say that the proximity of the highway entrance ramp and exit ramp being adjacent or across from each other creates more of a chance for drivers to enter the highway incorrectly. At the Kalka & Baer law firm, our personal injury attorneys have the experience to fight for each of our clients. We genuinely care that our clients are victims of such awful accidents and want to make the legal aftermath of accidents go as smoothly as possible. If you have been involved in a Georgia accident, please contact Kalka & Baer today.